A section of the Beaver Dam River that begins as an exhilarating urban paddle before quieting down towards the outskirts of town amongst suburban development, then narrowing again and alternating between wooded corridors, farmland and finally to a wider, almost marshy stretch, before the take-out. Add in a quite handsome train bridge, some minor drops and riffles, and you have yourself a great trip if you can catch it at the right levels – which for this trip was the first time water was released on the Beaver Dam River purely for recreational paddling. This is the recommended minimum level – any lower and you’ll be scraping. Between 150 and 250 cfs is ideal. Which, for this paddle, it was nearly right at 150 due to a recreational release. Over 250 cfs, the current gets pushy and especially feisty downtown where the river is narrow and there is little room for error in maneuvering. Time: Put in at 11:50a. Out at 1:20p. Wildlife: Pelicans, tons of ducks, geese, turtles, hawks and bald eagles. One of the earliest rivers I ever scouted when I first started paddling was the Beaver Dam due to its proximity to Madison and the fact that I traveled over it many times on trips to Green Bay. It was also one that I gave up on many times because it never looked very appealing. In fact, it always looked quite horrible whenever I stopped to check it out – always low, or muddy, or choked with weeds. It was, quite frankly, the last place I wanted to paddle (kinda like Starkweather Creek). But occasionally, I’d hear about someone paddling it, so I kept it on my list but way down on my C-List of paddling options (said A, B and C lists actually exist). Then, in 2016, when fellow-Miles Paddler, Timothy Bauer, released his excellent guidebook, I was kind of surprised he had this trip in it, and also, it was the first trip in the book (although I’m sure that was just organizational coincidence). But I thought, well, the dude has proven to know a diamond in the rough when he sees one, so it must be worth my time to keep waiting and watching for the right water levels to paddle it. Late last year I asked him if the levels even get to 200 cfs as recommended in the book. He said rarely (turns out the average is only 35 cfs) but I held out hope that I’d see the dial move on the gauge, but it rarely budged with any of the rains in late 2017. So I put it on my Spring “watch list”, figuring that would be the best time to find the right levels. That too turned out to be a little bit of a challenge. 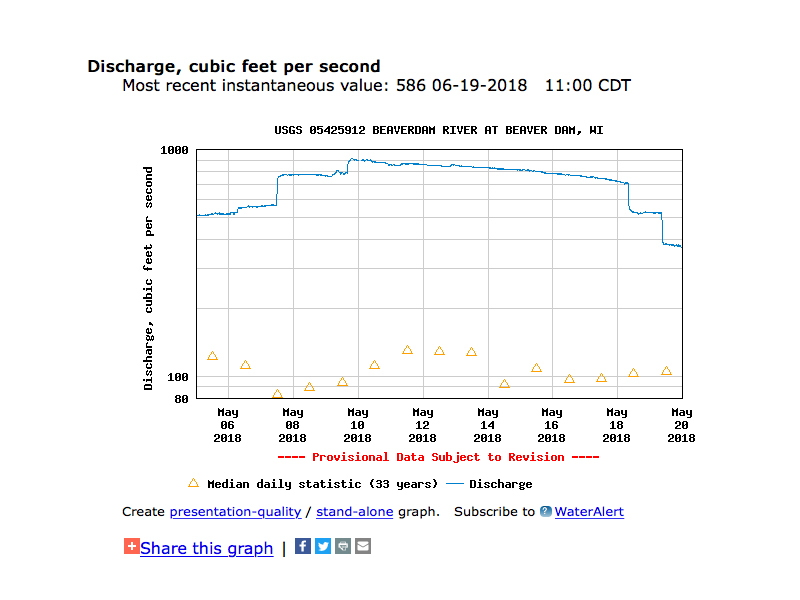 With a late Winter end/early Summer start, Spring was nearly forgotten except for the April showers which made for some insane levels on the river (we had some major rain and the gauge nearly reached 1000 cfs in early May). It also didn’t drop as quick as I thought it would. At 800 cfs I traveled to scout/maybe paddle it with a huge amount of wishful-thinking in my pocket (you don’t want to paddle it at 800 cfs to cut to the chase). While downtown near the water tower, I ran into a guy who motored in on a rumbling Harley. He noticed I was scouting it (did my kayak give me away? ), so he stopped and asked if I was going to do it. He said that he and a couple friends ran it a couple days earlier and all wiped out by the Kraft factory (mind you, a couple days earlier, it was nearing that 1000 cfs level! And the fact that anyone would consider running this higher than what I was looking at was crazy to hear just based on the eye test). There was no way was I going to even attempt it at 800, it looked really pushy and dangerous so I headed home (I actually texted my wife and said I didn’t feel like dying today). So, Beaver Dam, another day. But then, low and behold, a mix of coincidence/chance and good luck appeared on social media. I noticed someone post a map of this section titled “the best of the Beaver Dam” and it was this same section – and it mentioned something about a rec release!? A rec release for the Beaver Dam? That seemed random, I thought. And so I inquired to the poster and sure enough, a guy by the name of Joe was leading a trip down the river the next weekend. Turns out, he’s been working with the city to do monthly recreational releases. He said the upcoming weekend was actually suppose to be the second weekend of the test but due to high levels, this would be the first day of the rec release test (I wasn’t sure what they were testing… Popularity? But, the DNR has a say about this kind of thing and how it affects the environment, so they are the reason for the tests). Even the mayor of Beaver Dam, who is a paddler, was heading out with Joe and the group. Long story shot, after some back and forth, his group of about a dozen people were heading out and I had nothing to do that day except a graduation party in the evening so I asked to join. But they were starting at four in the evening, so unfortunately I wasn’t able to join them, but I wanted to take advantage of this random release regardless (wouldn’t you?). Even though our schedules didn’t align, he graciously offered to give me a shuttle, which I took him up on. So I showed up in Beaver Dam Saturday morning, expecting much “rec release” fanfare – you know, like a parade, ribbon cutting ceremony or something (I joke – in reality, nobody really knew about it). 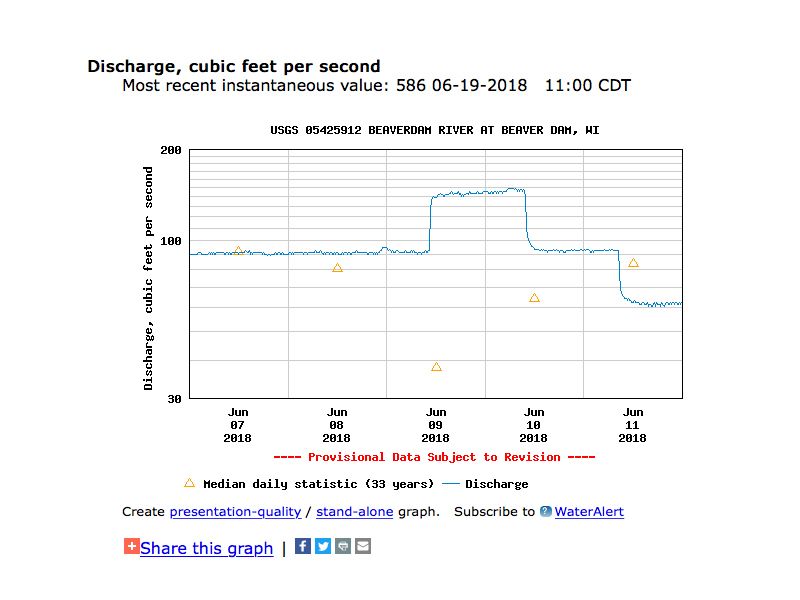 To be honest, I was a little nervous that it would even come to fruition because I was watching the gauge all morning and it wasn’t budging from a very low and unpaddleable 83 cfs. I had a hard time believing that the gauge would rise but by the time I dropped my boat, called Joe and met him at the take-out. But sure enough – it rose! – at about 11:00 – and at almost exactly the same time when I called Joe to set up shuttle logistics. It was happening! Joe met me at County Road J (with a canoe on top as he was on his way to Paddlefest) to give me a ride back to Cotton Mill Park. Cool Guy, for sure. He was a tour guide along the way, and I could tell that he just loved this stretch of the river. Along the way, he pointed out everything to be aware of like a couple wires, low bridges, etc., but with positive excitement (not warning, which is a big difference) and that got me excited to check it out myself. I saw Joe once more on my approach to the mill. He was on the bridge and he yelled “You’re the first person to run a rec release on the Beaver Dam river!”. It gave me a chuckle but really, it was kinda cool because he had a hand in my good paddling fortune that day. We waved and I carried on downstream. Timothy’s writeup is pretty accurate despite a few years between paddling and publishing. There’s only one notable difference – that being the Cooper Street bridge which was once made up of four diagonal culverts. That bridge, (coincidentally, where the USGS gauge is located) was replaced in 2017 and is now a more traditional concrete structure. The put-in at Cotton Mill Park is decent. One can choose to put-in anywhere along the riprap directly across from the former Cotton Mill, now-turned apartments. This is a popular fishing venue, so be wary and respectful of the tight lines cast in the effluence coming from the dam. Simply paddle river-right amongst the splashing fish beds to avoid a hook in the arm, or worse yet, an eye. The beginning of the trip courses through downtown Beaver Dam and is easily the funnest, most lively part of the whole trip. At the first bridge immediately after putting-in, Beaver Street, there’s a low head dam. You can portage on the far left if the idea of running a dam is not in your considered set, but it’s actually a rather easy drop, as long as you just keep your blades moving. The river then doglegs into downtown in a narrow corridored-like fashion with riffly current pushing and pulling you downstream. 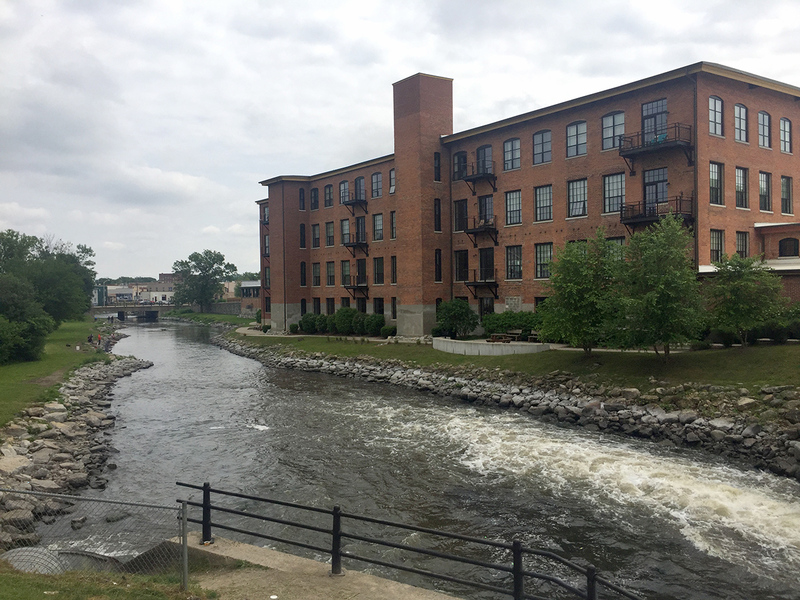 Soon after the watertower, the banks grow to a steep rock wall on both sides, and you’ll see the West Mill Street bridge in front of the Kraft Factory. This is the best drop of the trip. Take the right chute to ride the gentle but splashy wave (prepare to get wet). That Kraft mill rapid is intimidating not for the surf but because the current is fast, leading you to the trees beyond. Currently, (no pun intended) there are two crappy trees to negotiate (the ones Joe is trying to get removed and where the Harley dude wiped out). At these levels, they were easy enough to get by without portaging in a kayak, but a canoe would probably be more difficult due to your own height in the boat. The first tree will take some work to remove but the second tree/branch is small and a sawzall should take care of things (gift idea for any of my family reading this!) In the meantime, navigate both on river-left and portage river-left if you can’t make it under the second (and though smaller, the more awkward of the two to negotiate). I should note that I texted Joe after the paddle – letting him know that aside from the second branch, all was good in terms of obstructions. It was clear. He thought that was a good omen for his evening paddle. Past the factory, the river continues to wind towards the outskirts of Beaver Dam and it becomes slow and wide flatwater – like really flat – around the municipal water treatment plant. Timothy mentions this stretch is pretty dull, and he’s right. Thankfully, this is as wide as it ever gets. This continues all the way to and then beyond Highway 51 for a stretch. Joe pointed out, that when you’re going under Highway 51, take the center channel and look for the drips and light coming from the middle of the tunnel, then look up (avoiding the drips) and you’ll see Sky Blue Sky. Sure enough, of course he was right, it’s a short-lived moment that brought a smile to my face. After that is a stretch of backyard burbs on river-right and a wide weedy stretch, but eventually the river narrows and the paddle gets fun again. There’s a small drop, some riffles, and it’s just a much more interesting and intimate stretch. Soon, you’ll encounter some more riffles that lead to a beautiful stone railroad bridge, inscribed with a typographically fitting “1910”. There’s a wire (whose purpose, nobody knows but one could surmise this is the northern land fence of someone’s property) immediately on the downriver side of the bridge, but at these levels, it’s nothing to worry about. It’s easy to negotiate and duck below. In higher levels, it could be problematic but then again, you probably shouldn’t be doing this at higher levels! For what it’s worth, you’ll eventually encounter the southern wire which is (currently) clearly marked and easy to paddle below as well. Riffles continue as the river makes some gentle turns through the landscape and it’s quite enjoyable. Before Canary Road, it constricts even further and there’s a couple little drops and riffles near some private bridges that are all gentle and fun. After County Road S, the river gets wider, and therefore shallower. The canopy dissipates and boulders flank the right-hand bank. The surroundings are flat, grassy and open above the banks as it meanders towards the take-out. I really enjoyed this trip and not just because that elusive Beaver Dam scratch had finally been itched. I was initially 100%/full-on/guaranteed to give this a 3-star rating (and it probably is on some accounts). But after thinking about it, and the potential of this stretch considering where it’s located, and how much there is to experience in a short 5.5 miles, it certainly deserves 4-stars. On one hand, it’s as muddy and mucky as any other river in this area; the Bark, Crawfish, Rock, etc. On the other, when the river narrows, the river gets really fun. But overall, it’ll keep your attention with variety – specifically with the wildlife which was a pleasant surprise – there was a huge variety of critters in quite a short stretch. Plus, it’s close to Madison and it’s been not only recommended by Timothy’s guide, but also a guy I met randomly on social media who loves this stretch so much that he’s pushing for rec-releases in the least expected of rivers! And that means something. Therefore, it really is a little more unique than the average paddle, and quite enjoyable. Also, these rec levels were actually pretty solid – there were no portages and only three areas that got scrap-ey. I might suggest that even 160-175 cfs would be perfect for beginner whitewater-curious paddlers. I think most people who have paddled this particular area of Wisconsin would understand my reaction to what I didn’t like. It’s swampy at times – like most rivers in this area. They’re always muddy. But with the Beaver Dam in particular, it’s also very abused by trash and old farm implements (God forbid someone fall out of their boat and have to get a tetanus shot from stepping on an old tire rim). I don’t think it’s a timing issue either. I mean, yeah, it flooded recently, so I expect a bunch of old trash swept into the river or revealed, but having seen the same conditions elsewhere, there was a notable amount of garbage. Unless Joe single-handedly keeps it clean and clear, I wonder if it would be that appealing to most? I had the benefit of a recreational release – guaranteeing perfect levels – instead of holding out hope for Mother Nature to provide the ideal levels. As long as there are rec releases, I hold out hope that there will be more love brought to the river – specifically to cleaning it up. Because though it’s currently a diamond in the rough, it’s still a diamond. And I look forward to returning. Since I paddled this, there seems to be some excitement behind this as a destination, including the possibilities of actual landings for paddlers (no promises at this point). Also, Beaver Dam held another rec release on June 30th, 2018, and it sounds like there may be more in the works! I’m told future releases will be posted online either on the City’s site or maybe the Chamber’s (when/if that happens, I’ll update this post as to where that info can be found). In the meantime, Joe posts on this meetup group or on social when there is one. Update: I’m told that the next (and possibly last rec release in the near future – pending DNR testing) will be Saturday, July 21st, 2018 – catch it while you can. Put in along anywhere along the bank. This section is channelized, narrow and awfully fun. West Mill Street with Joe looking on next to the Kraft factory. There’s a fun surf to ride directly after the bridge. Take the right tunnel. Downstream of the Kraft mill. Riffly approach to West Davis Street. Last of the canopy and riffles for a bit. The “new” Cooper Street bridge. Highway 151 in the distance. … and then look straight up to clear blue sky. Wider and flat for just a bit more through the backyards of new build construction. You’ll see a ton of these guys. These weeds were how I envisioned the entire trip after scouting this river years ago. Many boulders pierce the water mid-stream and along the banks. Swift, with a little canopy – a favorite of mine. Approaching the beautiful 1910 arched Union Pacific railroad bridge. Up ahead: A finish line or a you’re finished line? An inconsequential boundary wire at these levels. Higher water, it’s probably a different story. Southern boundary wire – clearly marked. The river constricts and bends near a farm for one last gentle drop. And then it all gets wider and open. It’s a short clip from County S to County J.
Taking-out downstream river-right of County J.